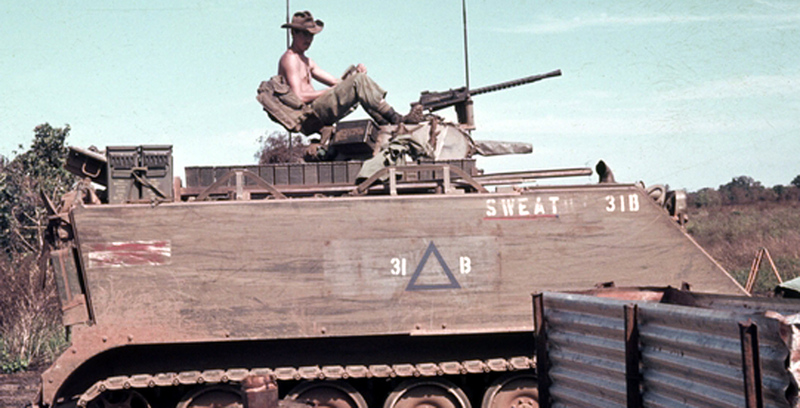 The first Australian M113A1 Armoured personnel carriers arrived in Vietnam in June 1965. The vehicles were armed with a .50 inch (12.7mm) calibre machine gun operated by the commander. 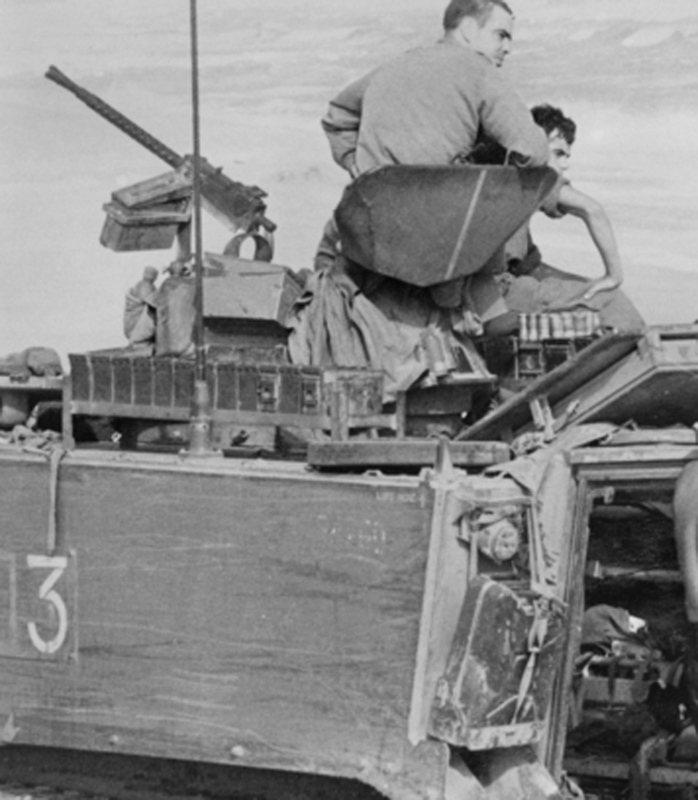 After a short time of combat experience extra 50 calibre ammunition liners were carried internally under the troop seats. This soon became difficult as it required the infantry troops to pass up liners to the commander. The ammunition liners then were carried on the hull roof within easy reach of the commander. 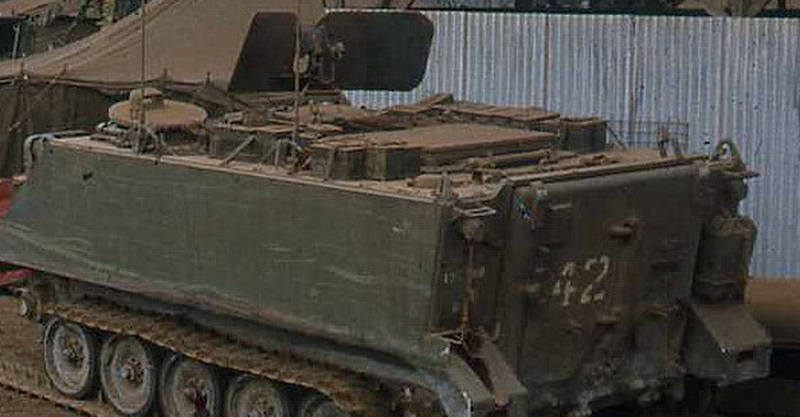 The liners were carried loose on the hull roof but were supported by wooden boards or US star pickets lashed to the aerial brush guards to stop the liners from falling over the side of the APC. By mid 1969 rectangular angle iron frames seem to have been constructed and again lashed to the aerial brush guards. These structures had either no upright "legs" or did have "legs" but were still not welded to the hull roof. It was not until 1970 that the more iconic angle iron structure at the lower edge was welded to "legs" which in turn were welded to the hull roof but also had a flat steel upper support which allowed loose liners to be stored safely. These two layer liners storage racks came in various lengths and shapes. .50 calibre machine gun with / without gun shield – length from half the hull roof to full length hull roof – generally on the right side of the hull roof. 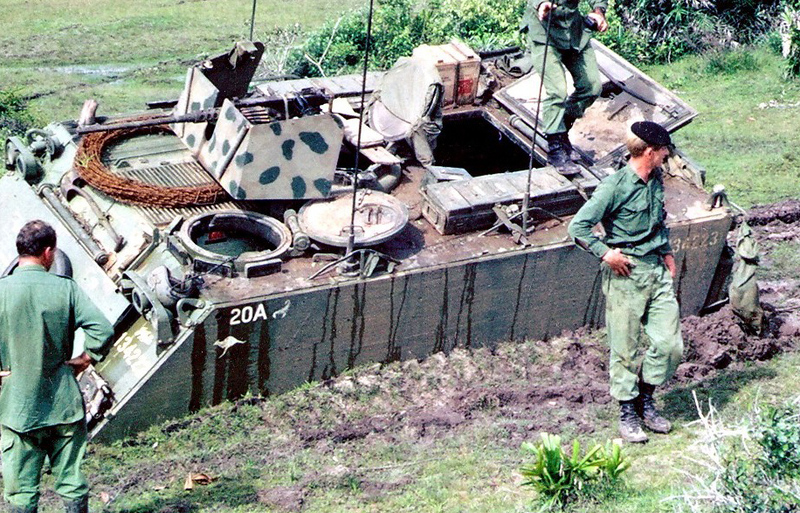 Later in the war after a claymore mine accident the addition of two 20mm US liners were carried in the right rear corner to carry the claymore mines. 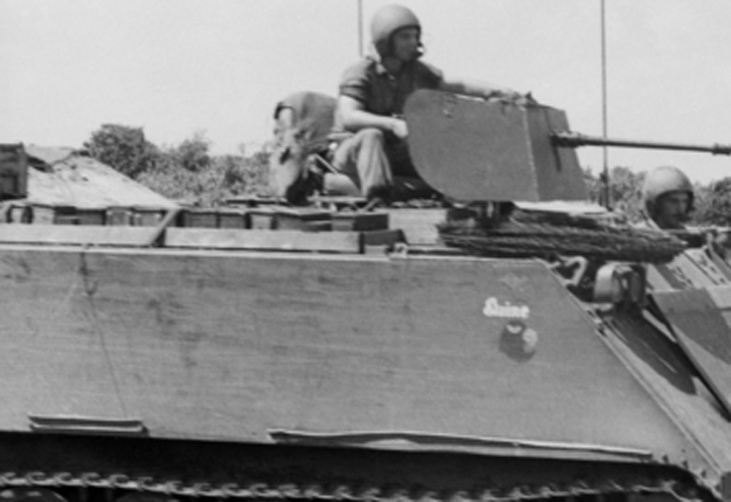 The T50 turreted 50 / 30 calibre armament vehicles had the 30 calibre stowage rack on the right side and the 50 calibre rack on the left side – to equate with the relative position of the machine guns in the turret. 1970 liner in angle iron frame but held in place by strapping & showing "legs"
1968 - appears to be a locally made four sided box strapped to the hull roof. 1968 two racks for 50 cal ammo plus wooden box for claymores. 1968 - US metal picket star strapped to aerial brush guards. Ammo liners loose. Wooden claymore box. 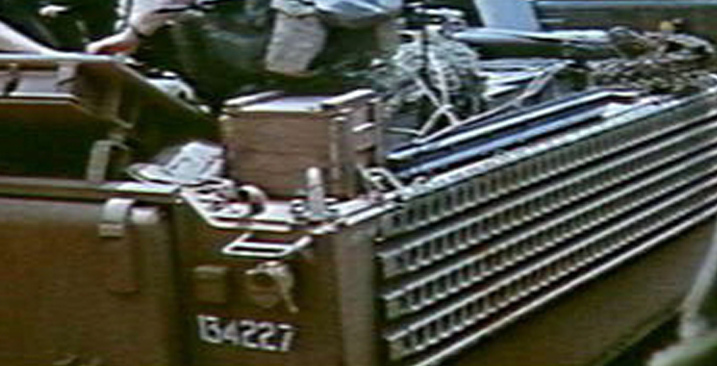 1969 - ammo liners in metal box. Flares stowed loosely. 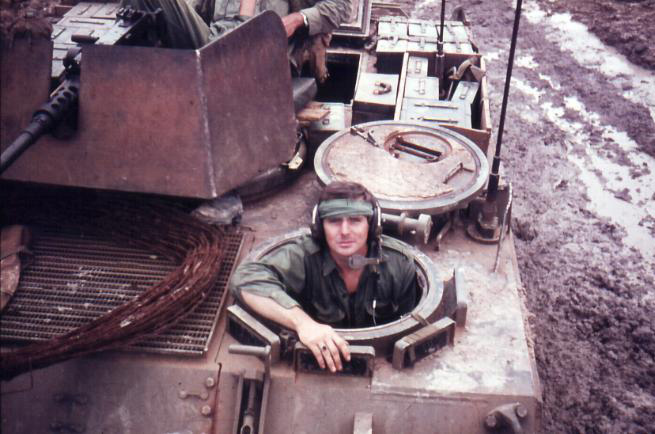 1971 - 2 x 20mm ammo liners for claymore mines and plastic explosives then an angle iron ammo rack to the engine deck. 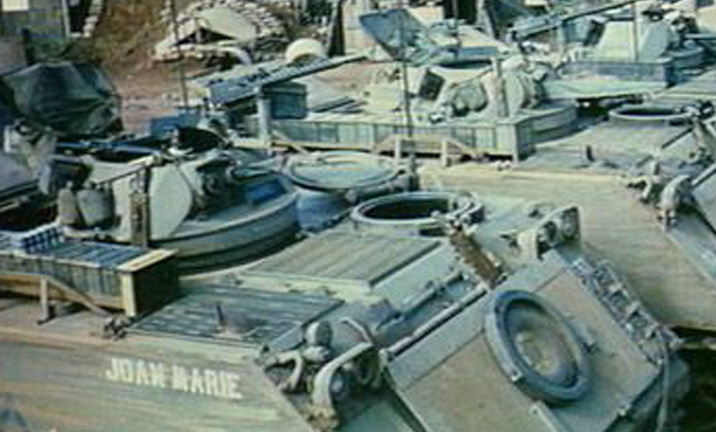 Both APCs with T50 turrets but one has 30/50 and the other 30/30 machine gun armament. 2 x 20mm ammo liners right rear corner plus 2 x angle iron ammo liners. 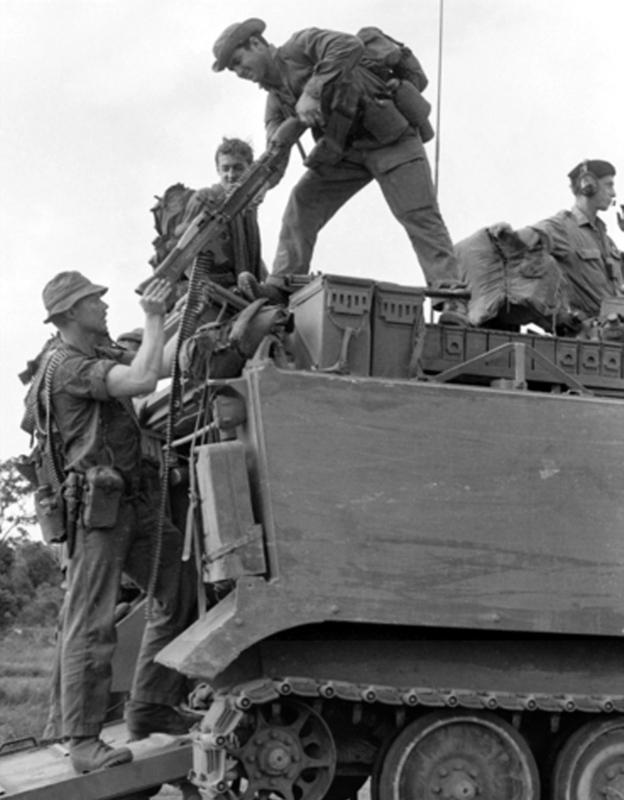 Ammunition liners were carried inside the M113A1 APCs under the troop compartment seats. These were soon carried on the roof and were generally strapped down to spot welded tiedowns points in groups of two-three liners. 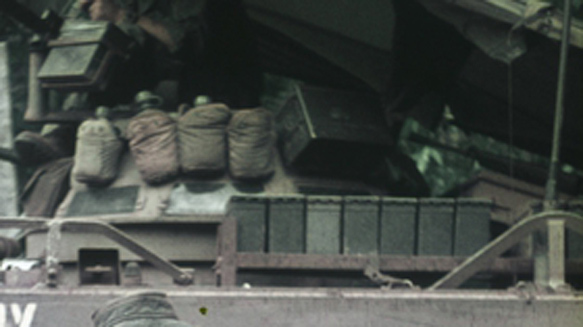 The strapping inhibited easy access to extra liners so the liners were carried in wooden or metal boxes from tank ammunition. At the same time the liners were carried loose on the roof but boards / star pickets / saplings lashed to the aerial brush guards stopped the liners from falling over board. From 1969 the early angle iron structures were used (without the top rail) to store the liners in long rows. The early structures were simply laid on the roof. Shortly thereafter angle iron legs were added to each corner and welded/attached to the hull. 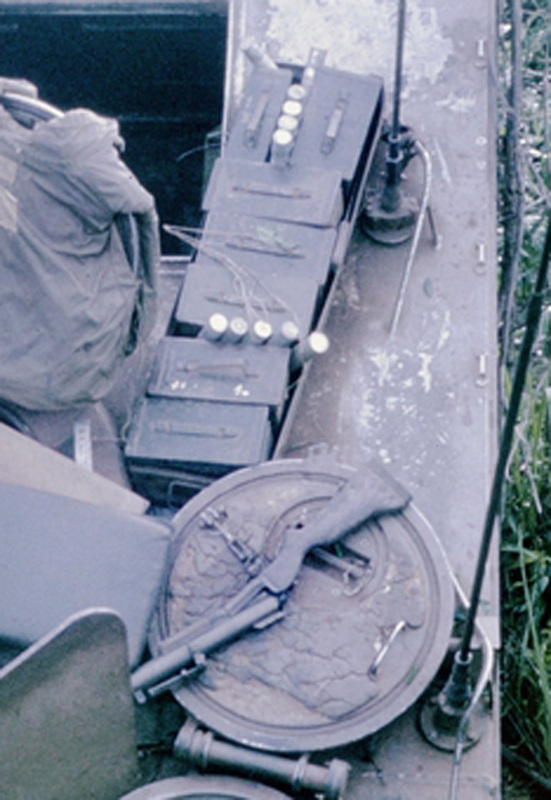 There is no photographic evidence that a second/top rail was added during the Vietnam war. This appears to be a post 1972 modification. 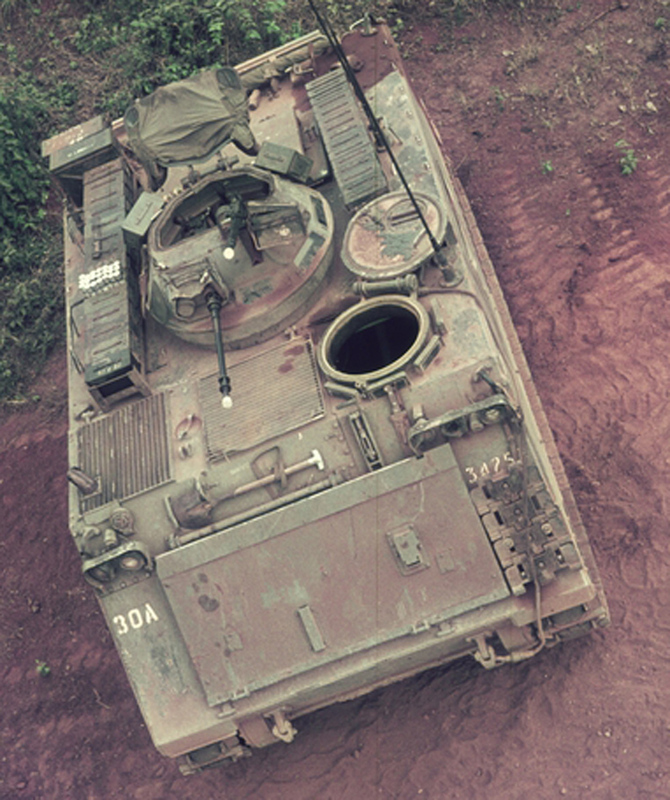 B Squadron 3/4 Cavalry Regiment also introduced a square (rather than long straight) ammo rack on the left side of the T50 turret in the 1980s.